President Trump has asked the Pentagon to plan a military parade in Washington DC on Veteran’s Day, November 11. Democrats have decried the cost and authoritarian implication, and antiwar groups are planning a countermarch. I spoke to Margaret Flowers, medical doctor, Green Party activist, and co-founder of the movement news website Popular Resistance, who is among those organizing the countermarch. Ann Garrison: Margaret, does this countermarch have a name yet, and what can you tell us about the coalition organizing it? Margaret Flowers: So far the coalition is just calling this the “No Trump Military Parade.” Our goal is to get so many people signed up to come that Trump feels compelled to cancel it. If that doesn’t happen, we hope that we can mobilize more people to come to Washington DC to oppose it than Trump can mobilize to support it. As far as the coalition goes, and this is still fairly young, we found that a number of organizations that Popular Resistance works with were organizing responses to the military parade. ANSWER put out a call for people to show up. Veterans for Peace and some of their allied organizations were organizing a veterans and indigenous peace march during that weekend, with a message to reclaim Armistice Day, which is what Veterans Day was initially. Interestingly, this is the hundred year anniversary of the first Armistice Day, the end of World War I. World Beyond War was also getting people to sign on to oppose the parade, so we thought, “Why don’t we bring all these people together and make this a big display of opposition to militarization both at home and abroad?” We had our first exploratory call last week and found that there was a lot of energy and a lot of unity in our messaging against US imperialism, militarization, and austerity for public needs. The people who are behind this are all groups who are strongly opposed to the corporate duopoly war party, and who have been working to revive the peace movement in the United States. AG: Some of those who identify as peace activists will no doubt say that this march is a reaction to Trump, not to the wars and weapons production that keep escalating no matter who’s in the White House. What’s your response? MF: Now that President Trump is in office, that’s the concern because that’s what the Democratic Party groups and the party itself do when Republicans are in power. They use these issues for their own ends. It’s interesting, and I know that you’re aware of this, that the Women’s March was not a march against US militarism. Among the so-called progressive Democratic Party candidates running in this year’s midterms, I haven’t seen anybody who has a strong antimilitarist platform. So there is a possibility that some of these Democratic Party groups will try to latch onto this effort and use it for their own purposes, but all the people and groups organizing this are opposed to the corporate duopoly war party. I think it’s important for us to make it clear that the United States has a long history of militarism, and that it has been escalating under recent presidents. Obama was worse than Bush. Trump is trying to outdo Obama. It’s not a matter of who’s in the White House or which party has the majority in Congress. It’s that the United States is the largest empire in the world, and we have a very strong military machine that demands to be fed constantly. So even if some of those Democratic Party members sign on, they may be adding numbers, but hopefully not diluting the message. AG: A Women’s March on the Pentagon, which is not a reaction to Trump but to war and militarism, is scheduled for October 20-21, the 51st anniversary of the 1967 March on the Pentagon organized by the National Mobilization to End the Vietnam War. Will you be joining or supporting that march as well? MF: We’re very excited about the Women’s March on the Pentagon. I think, like you, I refrained from participating in the previous Women’s Marches because they were organized by people who were part of the power structure. It’s been interesting to see what’s going on with that because people at the grassroots level didn’t seem to be altogether on board with those who were leading those marches. But, again, there was no strong antimilitarism component to those marches. So we were very excited when Cindy Sheehan announced her Women’s March on the Pentagon. I felt like, “Wow, now here’s a Women’s March I’ll actually feel comfortable participating in,” so Popular Resistance was one of the early organizations to sign on to that. We’ve been promoting it on our website, and I will be there, and we’ll be supporting it in any way we can. AG: Assuming Trump’s parade goes forward, there will no doubt be a tremendous amount of international media coverage, and the optics will be grim for much of the world if there’s no visible resistance. Will you be working on a media strategy with that in mind? MF: That’s one of the main reasons we felt so compelled to organize around Trump’s military parade. People around the world keep asking us, “Where is the antiwar movement in the United States? You guys are the aggressors, so why aren’t you doing anything about what your country is doing all around the world?” So having this kind of energy around this military parade—this gross display and glorification of militarism—is an opportunity for us in the United States to show the world that there is opposition to US empire and wars of aggression, including these so-called humanitarian interventions that so many progressives are supporting. And, in addition to having protests in Washington DC, we’re reaching out to our international allies around the world and asking them to hold actions on that day as well. And of course there’s a lot of international media in DC, and when we do actions on various issues, we tend to get more coverage from the international media than from the US media. So we will definitely be reaching out to them. AG: Do you think a countermarch will be allowed to get anywhere near the Pentagon parade, and have you considered that this might be a dangerous protest? MF: The benefit of having coalition partners who are actually based in Washington DC is that they can apply for permits as soon as the need arises, and permits are handed out on a first come, first serve basis there. 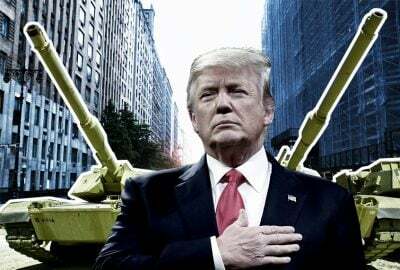 As soon as President Trump put out the message that he might have a military parade on Veterans Day, organizations that we work with quickly applied for permits in as many areas as they could think of where such a parade might happen. So we will have permits to be close to the parade, and we even applied for them before any groups that may come to support it. As to whether it might be dangerous: the police in DC are fairly used to dealing with protest, and most of the them understand our First Amendment right to freedom of expression. That’s not always the case; the police were very aggressive around Trump’s inauguration, but I think they may regret that. The public is very largely with us, and a lot of people in the military oppose this gross display of militarization, this waste of money and time, as well. If there’s a large turnout, that’s protective. The police will be a lot less likely to misbehave if there are a lot of people around. AG: The peace movement all but completely faded from view during Obama’s eight years in office, despite new US Wars in Libya and Syria, escalation of the US War in Afghanistan, and the expansion of US bases and militarism across the African continent. If the peace movement re-emerges under Trump, do you think it could survive the election of another Democratic Party president? MF: It was difficult to see the antiwar movement all but disappear while Obama was president. Of course we were out there protesting anyway, and when we helped organize the occupation of Freedom Plaza in 2011, it included a very strong antiwar component. It was disappointing to see antiwar protestors get confused by a Democratic president who was such a militarist. So we just have to keep working at reviving and growing the antiwar movement here, and try to demonstrate that this goes across political parties, that both Democrats and Republicans are funded and lobbied by the weapons manufacturers and all the other elements of the military industrial complex. The 2018 military budget is $700 billion, and it just keeps growing. It now eats up 57% of our discretionary spending, leaving only 43% for education, transportation, housing, and all our other human needs. We need to demonstrate that this makes us less secure as a nation by creating more animosity towards us around the world and isolating us in the global community. Other nations are finally getting more courage to stand up and say they don’t want to be bullied or controlled by us anymore. So this hurts every single person in the United States, as well as the masses of people suffering all the casualties and injuries and agony caused by US wars. No matter who’s in office, we have to push the United States to pull back our troops on foreign shores, close down our 800 or more military bases, and redirect our resources to human needs here at home and reparations for all the damage we’ve done around the world. AG: How can listeners find more information and/or sign on to attend or engage in planning the November 11 countermarch? MF: We just got a website up: No Trump Military Parade. This interview was originally published on Black Agenda Report. Margaret Flowers is a medical doctor and a peace, justice, Green Party activist, and co-founder of the Popular Resistance website. She can be reached at popularresistance.org or [email protected]. Ann Garrison is an independent journalist based in the San Francisco Bay Area. In 2014, she received the Victoire Ingabire Umuhoza Democracy and Peace Prize for her reporting on conflict in the African Great Lakes region. She can be reached at @AnnGarrison or [email protected]. Featured image is from Salon.com.